It takes both an intimate knowledge of off-the-beaten-track Bath and a vision working over time to find and see the potential in an unloved, 1950s two bedroom bungalow with a derelict garden on the very edge of town. But when the brief is, we want value, we want a project and we do not want to look at houses across the street, this house provides a perfect solution. While the family lived in the house it doubled in size to become a five bedroom split level home with an airy kitchen, dining, living area with to-die-for views over the Charlcombe Valley. The tired, drab shell has been transformed into a bright and energetic full-on family home that is much loved by owners happily surprised by just how much they have achieved. This project involved Hazael Homes in every step of the process. Searching to the last page of availability. Recognising potential. Securing a sympathetic sale price. Envisaging the remodelling and expansion. Managing drain build-overs, architect and trades. Sourcing materials and specifying detail. Scheduling trades. On-site management of building and fit out. Before: This flat needed some serious tlc to sort out the woodchip papered walls and ceilings, replacing tired carpet with noise reduction wooden flooring and a new kitchen and bathroom, bespoke carpentry in the bedroom, living room and study. 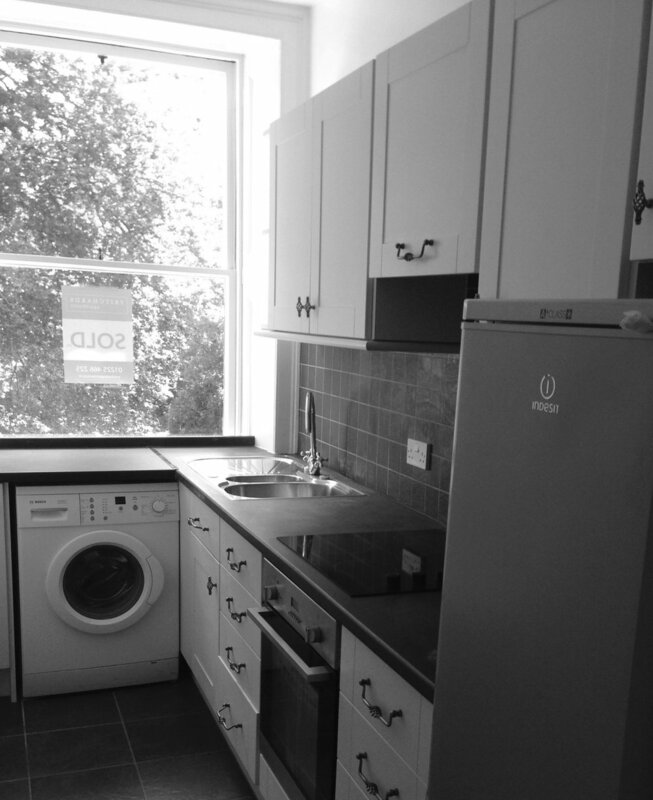 After: A fitted kitchen with integrated appliances, open shelving and new wooden flooring was part of the major renovation of this two bedroom Georgian apartment in the centre of Bath. A stone's throw from one of Bath's iconic streets and museum, this two bedroom apartment was fashioned out of a town house in the 1980s. Hazael Homes were appointed to help the clients, who were living abroad, update and renovate their new home within budget and in time for their move to brilliant Bath. Working within the constraints of time and budget, Hazael Homes project managed this renovation from start to finish, organising the schedule, budget, quotes, sourcing materials and fittings, and overseeing trades. The tired flooring, outdated kitchen and bathroom and the woodchip wallpaper had to go. By carefully peeling back the layers, and re-plastering where necessary and, the flat become open, airy and sophisticated. A new wooden floor with acoustic underlay was laid throughout. A walk-in shower, built-in his and hers study, a bespoke fitted wardrobe in keeping with the Georgian architecture, new wiring and lighting completed the job. Here's what the clients had to say. Imagine living overseas and needing to find a project manager to completely renovate your new flat in a new city in which you’ve never lived. You won’t meet them, or see the flat, until the day you move in. Sound impossible? It would have been if we hadn’t found Hazael Homes. They fully renovated our shabby, run-of-the mill, flat into a classic, contemporary home in the city centre. They were easy to work with, have an eye for detail, lots of ideas, know the trades and costs, kept ongoing dialogue about the budget, and quickly noted and corrected any issues. The flat was ready on time, and on budget. We can’t say enough good things about them.